Okay! Now it's time to dress up the table a little. First, I used a one-inch flat brush with very soft bristles. I loaded it with clean water and gently pulled a puddle of water over the entire table, including the areas of shadow under the dish painted earlier. The only things I left untouched with water were the actual dish, and the candies both in the dish and on the table. It is extremely important not to put pressure on the brush - use a VERY LIGHT TOUCH!!! The brush should basically just push the water around, not really even touch the paper. The less you can stroke the less wash-out or heavy bleeding of pigments you will have. If you used very thick, heavy pigments for your shadow areas it will lift a lot. You will notice that lots of color flows into the water. All I can say is that this is a good lesson to keep your pigment applications thin, transparent and use lots of water with each glaze! Now that the table is covered with a generous amount of water, you should see a shine to it. Some areas may still have measurable puddles. Gently tip your board to be sure the water is absorbing evenly into the paper. While it is still shiny, apply small amounts of French Ultramarine Blue and Permanent Alizarin Crimson by dripping it into the wetted areas. 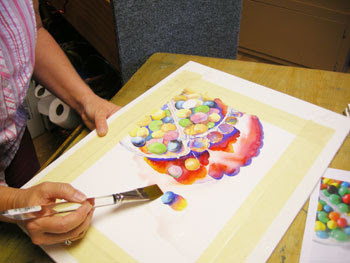 Put your brush down and tip the board to create soft areas of slightly blended color. 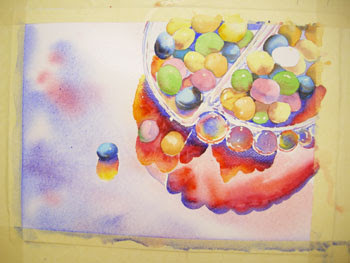 Notice that I have added some Winsor Red to the red candies. 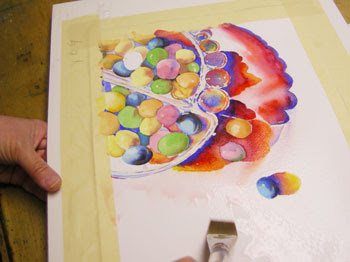 Use any of the bright, warm reds on your palette for the candy glaze. I have also deepened the yellows with a glaze of New Gamboge and a little Quinicridone Gold.